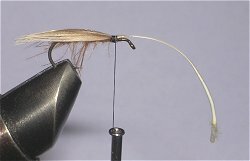 When CDC entered the fly tying market, we were early adopters to this new material - the characteristics of the material was really interesting - now you could tie dry flies that had the ability to float without being prepareted with some floating spray or oil, and it really looked nice on the fly with its soft structure. 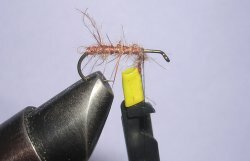 In the flora of flies we tied using CDC in some or another way, one really stood out, and still does, the amazing CDC-12! 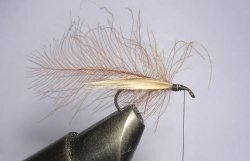 As mentioned in the article about the GHE-12, the classic Européa 12 is classic for a reason - it is a really good caddis immitation. One of the most significant parts of the e-12 is the wing; a mallard breast feather tied sedge. That is what makes this CDC-fly the CDC-12 - the wing is there in classic e-12-style, and that is also what makes the difference from other CDC-patterns we tried out and why this pattern will always remain in our fly-boxes. With our experiance, combined with our willingness to try out new patterns, we are not afraid to state that the CDC-12 are actually better then the classic Européa 12, and actually better then all floating caddis immitation with the exception of the original Ismo-pupa. 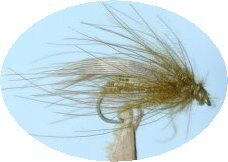 So, we may have invented (with the disclaimer that we actually have not tried all the caddis immitations that are out there - only a lot of the known ones) the second best, and that is quite a nice feeling. Ok, our CDC-12 might actually be number two in the rankings of floating caddis immitation, but how about number one, The Ismo-pupa - what is that and why is that fly superior?! The Ismo-pupa (Ismopuppa in Swedish) is created by Ismo Hyvärinen from Kiruna. It is a fly that is quite different from most of our traditional flies since the body is made of balsa wood, and it takes quite some time to produce a fly. The balsa wood has to be glued to the hook, sculptured to get the correct profile, and then the time comsuming painting job starts. 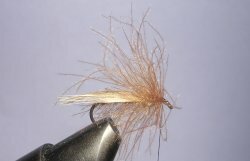 The result is a fly that floats perfectly and are extraordinary well suited to attract grayling to stroke. Our fishing trip had started quite tough - we had caught some fish, but no more than we bearly could feed upon. 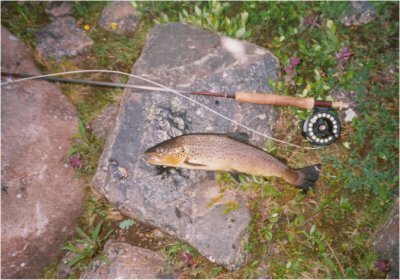 The surroundings were fantastic up there in the most northern part of Sweden and we had the fishing water all to our self, but what does this help when you can´t find the fish? It all changed on day tree when we found the stream we later named "the mail-stream" (because "it always deliver"). The mail-stream was formed by four separate small rapids ending up in one common pool, and just where the rapids ended up in the pool we saw some activity in the surface. With a CDC-12 on our respective leader we attacked the spot, and suddenly the fishing was great - the streams and the following pool seemed to hold nearly an infinite amount of fish and our fishing trip was suddenly a real success. This was the real test for the CDC-12, and it proved its abilities. 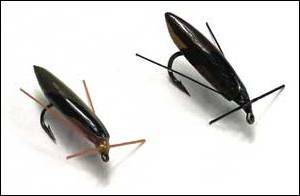 Since then, it has done this over and over again, and that is the reason we dare to at least state it is the number two of floating caddis immitations! We have tried out several coulors and body sizes on the CDC-12, and the result is that you can be quite flexible on the coulor but not on the size. 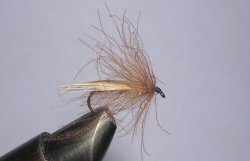 Maybe brown CDC is the most allround, but also olive and blue dun delivers, as long as you keep the hook-size to 12. 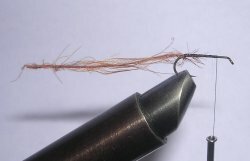 Twist the CDC feather and wrap it up against the hook eye - save a few millimeters for the wing and the hackle. Attach the CDC feather that will form the hackle. A little head by the thread and then the fly is finished.